BlackBerry maker Research in Motion has announced two new NFC-enabled handsets, bringing its range of NFC phones to eight devices. Two new NFC-enabled BlackBerry smartphones, the Bold 9790 and Curve 9380, will arrive at retail around the world “over the coming weeks.” Both handsets include built-in support for NFC and run the BlackBerry 7 operating system. 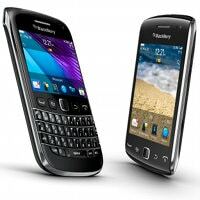 The high-end BlackBerry Bold 9790 has a 2.44-inch touchscreen display with 360×480 resolution, and is powered by a 1GHz CPU. The phone comes with a Qwerty keypad, 8GB of onboard memory and includes a microSD slot which allows up to 32GB of additional space. The 9790 was known by the codename ‘Bellagio’ while the 9380 was dubbed ‘Orlando’ when the devices first surfaced in September. The handsets join the Porsche Design P’9981, a leather and stainless steel-clad phone announced late last month and expected to retail at US$2,000, to give Research in Motion a line-up of eight NFC phones. How come the NFC capability is disabled in the phones available in the United States of America? MY understanding is that while capable the software does not enable this functionality in the United States. Any explanation for this? Are any of the fully enabled models available in the U.S.?